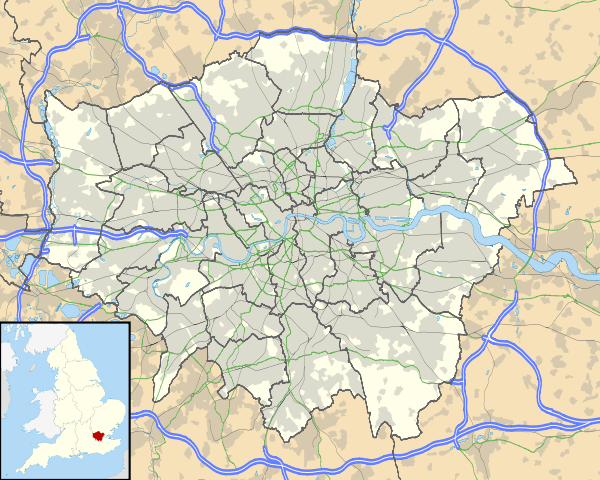 Ilford is a large cosmopolitan town in the north-east of London, England, and the administrative headquarters of the London Borough of Redbridge. It is located 9.1 miles (14.6 km) north-east of Charing Cross and is one of the major metropolitan centres identified in the London Plan. 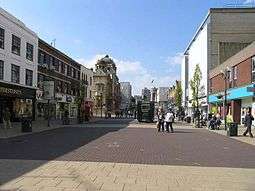 Ilford forms a significant commercial and retail centre surrounded by extensive residential development. It was historically a small rural settlement in the county of Essex and its strategic position on the River Roding and the London to Colchester road caused it to develop as a coaching town. The arrival of the railway in 1839 eventually accelerated that growth and as part of the suburban growth of London in the 20th century, Ilford significantly expanded and increased in population, becoming a municipal borough in 1926. Since 1965 it has formed part of Greater London. 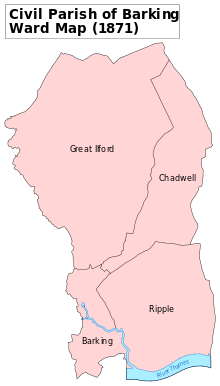 Ilford is part of the IG postcode area, though areas to the west of Ilford Hill and the A406 are part of E postcode area instead. The population of Ilford, comprising the Clementswood, Loxford, Goodmayes, Newbury, Mayfield, Seven Kings, Barkingside, Clayhall, Fullwell, Fairlop, Cranbrook and Valentines wards, was 168,168 in the 2011 census. Ilford was historically known as Great Ilford to differentiate it from nearby Little Ilford, in the London Borough of Newham. The name is first recorded in the Domesday Book of 1086 as Ilefort and means "ford over the Hyle"; an old name for the River Roding that means "trickling stream". Little Ilford shares the origin. The radio, electronics and telecommunications company Plessey, founded in 1917 in Marylebone, moved to Cottenham Road in Ilford early in 1919 and then to Vicarage Lane where became one of the largest manufacturers in its field. During World War II, the factory was heavily damaged by bombing and the company carried out much of its manufacture, with 2,000 workers servicing a production line, located in the underground railway tunnel between Wanstead and Gants Hill. In 1955 the company employed 15,000 workers, in sites throughout Ilford and neighbouring areas, with an extensive research department. BAL-AMi Jukeboxes were manufactured at 290-296 High Road, Ilford, during the 1950s, which also served as the headquarters of the Balfour (Marine) Engineering company. The town is served by Ilford railway station on the Great Eastern Main Line in Travelcard Zone 4. All trains calling at the station are the high-frequency Liverpool Street-Shenfield. This service was taken over by TfL Rail on 31 May 2015 for the new Crossrail project set to run through Ilford in 2017. Gants Hill tube station is located in the north of Ilford and is served by the Central line of the London Underground. It is planned that the Liverpool Street-Shenfield service will be replaced by Crossrail in 2018. The first stage of the East London Transit begins at Ilford. Ilford Cricket Club plays home games at Valentines Park. This ground was opened in 1897. It was formerly used regularly by Essex County, but inadequate maintenance meant that the county stopped using it after 2001. ↑ Mayor of London (February 2008). "North East London sub region". Greater London Authority. Retrieved 28 August 2009. ↑ Mayor of London (February 2008). "London Plan (Consolidated with Alterations since 2004)" (PDF). Greater London Authority. 1 2 3 4 5 6 7 8 Powell, W.R. (Edr.) (1966). The borough of Ilford, A History of the County of Essex: Volume 5. Victoria County History. British History Online. Retrieved 28 August 2009. ↑ Great Britain Historical GIS / University of Portsmouth, Ilford parish population. Retrieved on 28 August 2009. 1 2 Mills, A.D. (2001). Dictionary of London Place Names. Oxford. 1 2 Powell, W.R. (Edr.) (1966). The ancient parish of Barking: Introduction, A History of the County of Essex: Volume 5. Victoria County History. British History Online. Retrieved 28 August 2009. 1 2 "Redbridge Museum". Redbridge.gov.uk. Retrieved 2 March 2014. ↑ "Ilford History and Chronology". Retrieved 27 July 2007. ↑ Robson, William (1939). The Government and Mis-government of London. London: Allen & Unwin. ↑ Great Britain Historical GIS / University of Portsmouth, Ilford UD/MB (historic map). Retrieved on 28 August 2009. ↑ Rose, D (1999). The London Underground: A diagrammatic history. 1 2 3 "UKPollingReport Election Guide 2010 » Ilford North". Retrieved 2 March 2014. 1 2 "UKPollingReport Election Guide 2010 » Ilford South". Retrieved 2 March 2014. ↑ The Daily Telegraph (December 2011). "TripAdvisor: Ilford is Europe's fastest growing tourist destination". The Daily Telegraph. 1 2 Mike Gapes. "Ilford South - a profile". Retrieved 28 August 2009. ↑ "London, Greater London: Average conditions". BBC Weather Website. BBC Weather. Archived from the original on 28 February 2011. ↑ "August 2003 — Hot spell". Met Office Website. Met Office. Archived from the original on 28 February 2011. ↑ "Monthly temperature records by country". Met Office Website. Met Office. Retrieved 22 September 2013. ↑ "Greenwich 1981−2010 averages". Met Office Website. Met Office. Retrieved 10 April 2013. ↑ "NOAA". National Oceanic and Atmospheric Administration. Retrieved 20 October 2013. ↑ "Heathrow Climate period: 1981−2010". Met Office Website. Met Office. Retrieved 22 September 2013. ↑ "South Asian Development Partnership - Research,". Southasian.org.uk. Retrieved 2 March 2014. ↑ "Setting up your business in London" (PDF). Thinklondon.com. Retrieved 2 March 2014. 1 2 Transport for London (March 2009). "High frequency services" (PDF). Greater London Authority. Retrieved 28 August 2009. ↑ National Express East Anglia (May 2009). "Table 6" (PDF). National Express Group. Retrieved 28 August 2009. ↑ "Crossrail maps: Route map". Crossrail. Retrieved 28 August 2009. ↑ Transport for London. "East London Transit". Greater London Authority. Retrieved 28 August 2009. 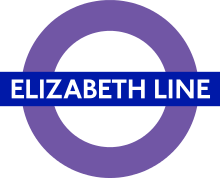 ↑ Transport for London (September 2007). "Buses from Ilford" (PDF). Greater London Authority. Retrieved 28 August 2009. ↑ "About us | Kenneth More Theatre". Kmtheatre.co.uk. 3 January 1975. Retrieved 2 March 2014. ↑ "Valentine's Park | England | Cricket Grounds". ESPN Cricinfo. Retrieved 2 March 2014. ↑ Steen, Rob (8 September 2001). "Cricket Focus : Essex heartbreak at Valentines Park". The Daily Telegraph. London. Retrieved 2 March 2014.